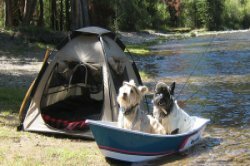 Riverside Campground and Cabins is a pet friendly establishment. We allow pets in our sites, cabins and rooms, except the Studio. We allow a maximum of two pets per site, cabin or room. National Forest campgrounds permit pets, but they are required to be leashed and under control. This is true not only in the campground but also when hiking. We have 28 acres of lovely, mostly wooded, well maintained land and "the largest campground dog park on the east coast". Close to Washington DC, Annapolis, Baltimore. Dogs of all sizes are allowed, but there can only be 2 large dogs or 3 if they are very small.